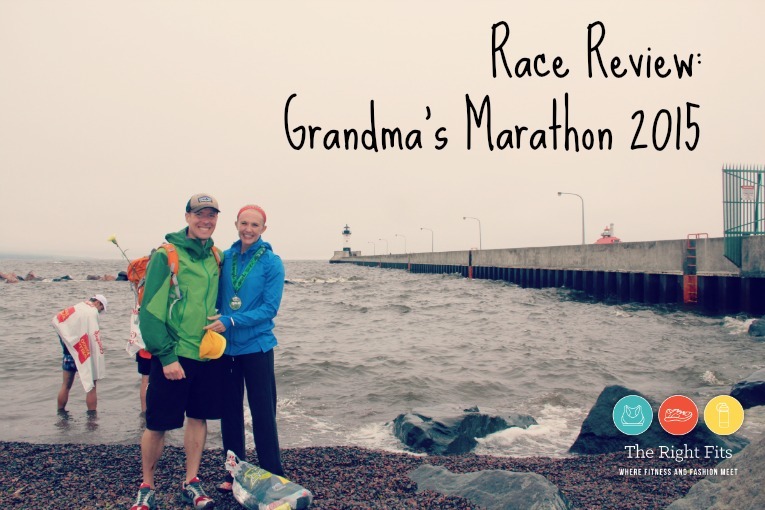 I obtained my “Grandma’s” experience, an experience that I said every good Minnesota runner needs to have. 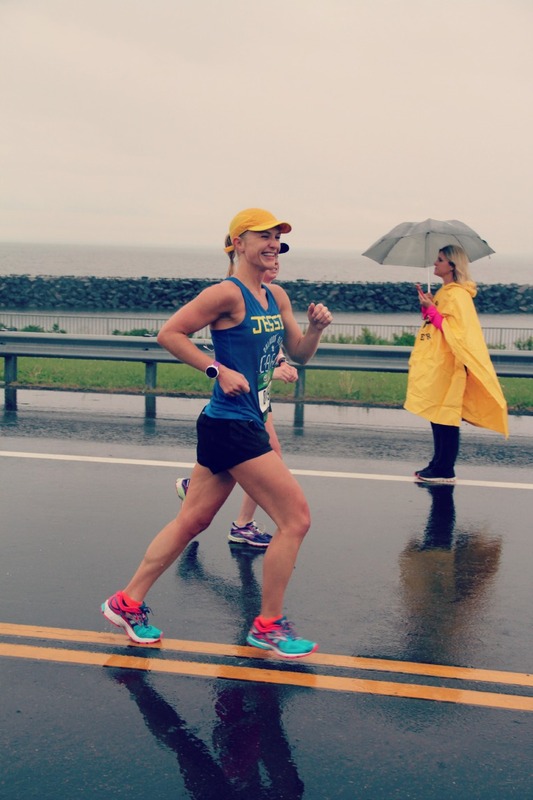 My Grandma’s experience included a torrential downpour, a broken toe, AND a big PR! Let’s start at the beginning. We drove up to Duluth on Friday, which is about a 2.5 hour drive from Minneapolis. 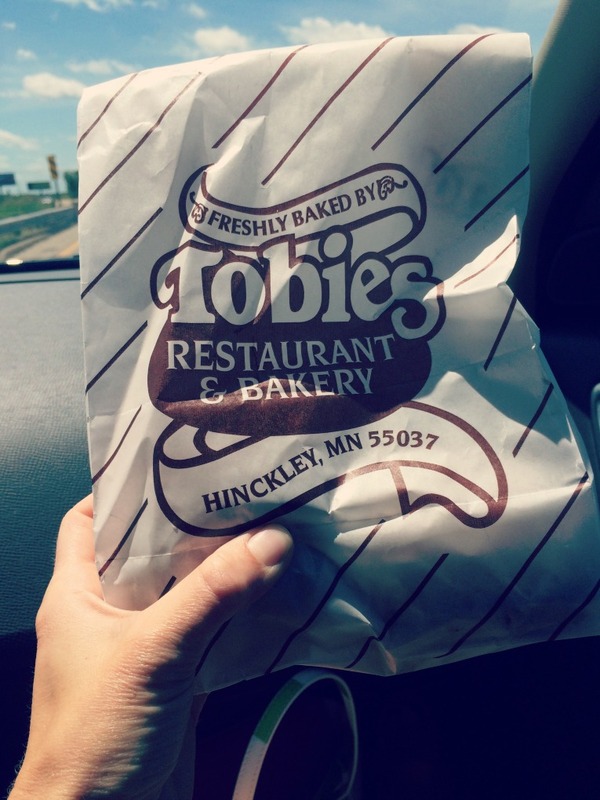 We stopped along the way in the town of Hinckley, MN for Subway and Dustin purchased a caramel roll from Tobie’s for breakfast the next day (no fair!). He wasn’t running the marathon, but biking along to cheer for me at various spots, so a caramel roll was just fine for him! We arrived in Duluth around 2 pm and headed straight to the expo. Traffic getting off the highway to the expo was quite backed up, but the expo itself wasn’t all that crowded, especially compared to what I expected. I had heard that the expo was going to be super packed and a bit disorganized. I actually didn’t think it was that bad, maybe being there a little bit earlier in the day helped. Nothing compares to the long lines and disorganization of the Berlin Marathon expo! 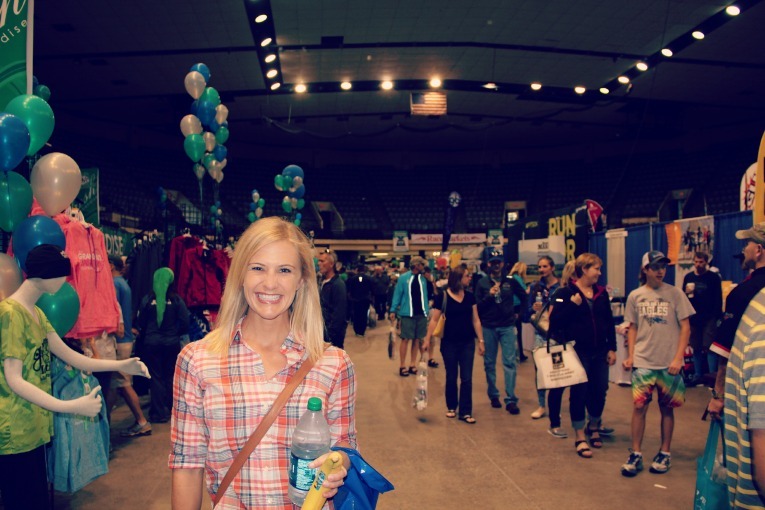 The Essential Health Fitness and Health expo was held in the Arena at the DECC (Duluth Entertainment Convention Center) and was free and open to the public on Thursday, June 18, 2015 from 5 p.m. to 9 p.m. and Friday, June 19, 2015 from 10 a.m. to 9 p.m. I had actually paid $25 extra to have my bib/chip mailed to me ahead of the race. I did that when I registered at a train station in Japan because I wasn’t sure if I was going to be able to take Friday off of work. With my bib/packet already in hand, I actually didn’t need to go to the expo. However, Dustin was registered for the William A. Irvin 5k Friday evening and he needed to pick up his packet for that, so we headed to the expo anyways. I was glad I did though, as I ended up purchasing a bright yellow Grandma’s Marathon jacket, a cowbell (for my friend Carla to use the next day for cheering) and a Grandma’s Marathon coffee cup. I had decided to register for Grandma’s somewhat late in the game. By that time, there were no hotels available, but the university apartments still had vacancy. The dorms are also open for rental, though those would include communal showers. At least the apartment had a private bathroom! It was about $400 for two nights and the apartment had two bedrooms with two twin beds in each room. 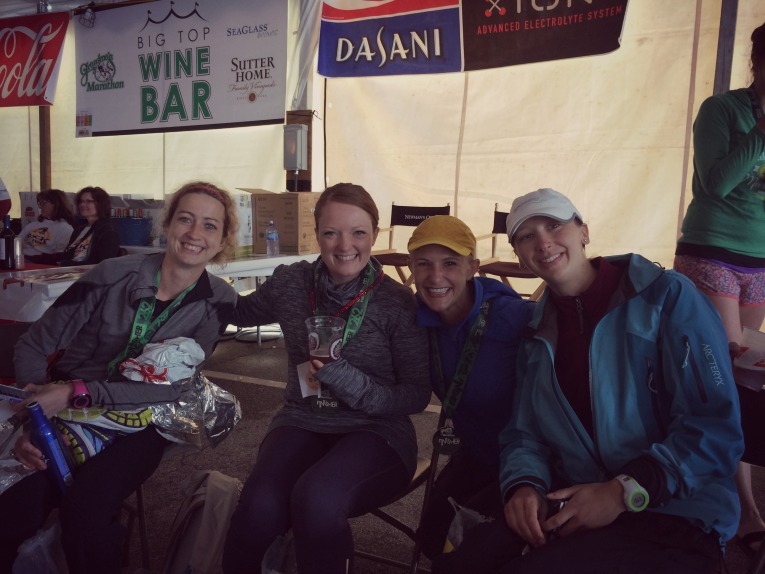 My friend Whitney (who was running the marathon) ended up rooming with us, as well as our friend Carla who came up to cheer last minute. The apartment had a full kitchen which was nice for cooking up some pasta the night before the race. The beds were a little uncomfortable, but that was my only complaint. If you want to stay at a hotel in Canal Park (by the finish line) you really have to reserve a spot pretty far in advance. Expect to pay a premium as well. In addition to the full marathon, there is the Garry Bjorkland half marathon. This race is run on the second half of the marathon course and starts at 6:15 am (vs. the full marathon start time of 7:45 am) There is also the William A. Irvin 5k on Friday night, which Dustin and a few of our run club friends decided to race. After checking into our apartment. we only had a bit of downtime before we headed back to Canal Park for Dustin’s 5k. 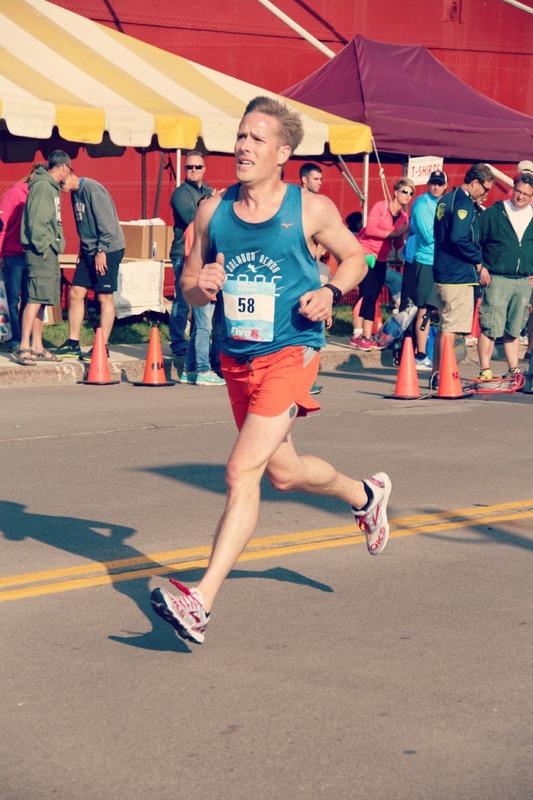 He wanted to beat his time from the Brian Kraft Memorial 5k of 18:01, but he ended up with 18:13 at this race. That sub-18 minute time will be his eventually! After the 5k, it was back to our apartment for some pasta and an early bed time. Whitney and Carla had made a big batch of orzo with tomatoes, basil, garlic, and feta cheese. It was perfect. My alarm went off at 4:45 am. I ate a plain bagel with peanut butter with salt sprinkled on. My coach had suggested that I increase my salt intake due to the warm temperatures and high humidity in the forecast. I also ate a banana with salt sprinkled on it and drank plenty of Gatorade and water. There was no coffee pot in the apartment and unfortunately I hadn’t brought my own. There was complimentary coffee in one of the nearby university halls. I tried it- it was NOT coffee. It was lighter than tea and did not taste like coffee at all! I can drink bad coffee, but this…this was not coffee. There were shuttle buses from the UMD campus running from 5:45 to 6:15 am. Whitney and I caught one right at 5:45 am. The signs leading us to the shuttles were super easy to follow. We found ourselves at the starting line around 6:45 with an hour to kill before the start. We were only there about 20 minutes before it started to rain. It started slowly but before long it was a downpour. We had no coverage and just had to wait there in the rain. Whitney and I had ponchos that worked well to keep us dry…except for the shoes! 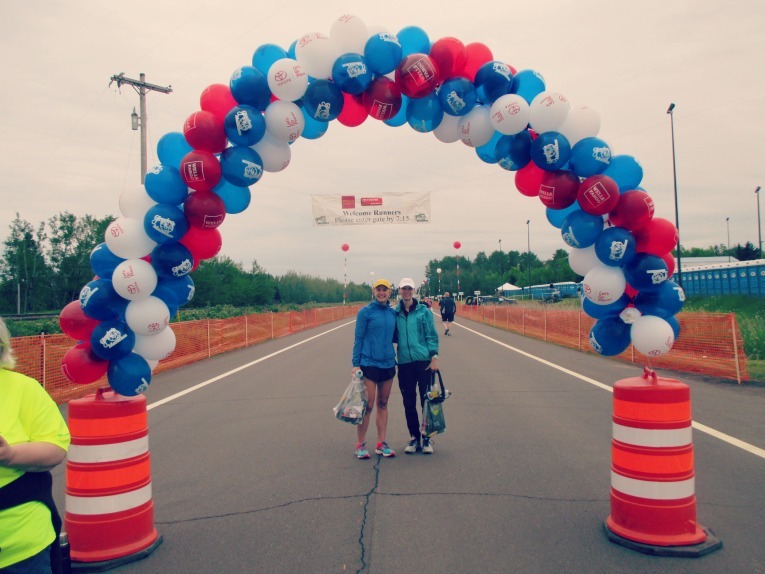 My shoes were sopping wet by the time we made our way to the starting corrals. I was a little worried about how that would affect my broken toe and the tape on it, since it was definitely not staying dry inside my shoe! I dropped my gear check bag off around 7:15, which had my camera in it, so I didn’t have any pictures of us in our fancy ponchos. Even with the ponchos, we were all looking a bit like drowned rats by the time we started! The race started promptly at 7:45 am. The National Anthem was sung and then we were off! No matter how many times I have been at the start line of a marathon, it still gives me chills. I’m still nervous. That’s part of the fun, right? It’s always a little surreal to not know what’s going to happen over the next 3-4 hours…Will it be a success? Will it be a failure? I started the race with a few of my fellow run club girls, but let them pull ahead pretty early. I knew that I had to run my own race. As much as I enjoyed their company, I didn’t want to feel pressure to keep up. Throughout the race, I would actually catch up with a few of them occasionally, then lose them again, and vice versa. Most of the time I was on my “own.” No music, no conversation- just me and 7,000 other runners making our way to Duluth in the rain. The weather at Grandma’s can be really good or really bad. The two years that Dustin ran this race, it was really hot and sunny. On a sunny day, there is no shade on the course. So even though it was a torrential downpour at the start, I was happy for the rain. It kept things cold. Cold is GOOD for a marathon! Despite the rain, I experienced minimal chafing. I had coated the usual spots with Good Sport which definitely helped and I also apparently made good choices with my fitness fashion. I wore my Calhoun Beach Running Club singlet, which is a Mizuno Inspire singlet. I wore a Moving Comfort Serena sports bra (sadly, these have been discontinued), Brooks Ravenna 6, and the Oiselle Distance shorts. I also wore a yellow Lole hat, which is my FAVORITE hat (I think now it’s my lucky hat!). A rimmed cap is a must-wear in the rain, as it really helped to keep the rain out of my eyes. I can’t find the exact one online anymore, but this one is similar. 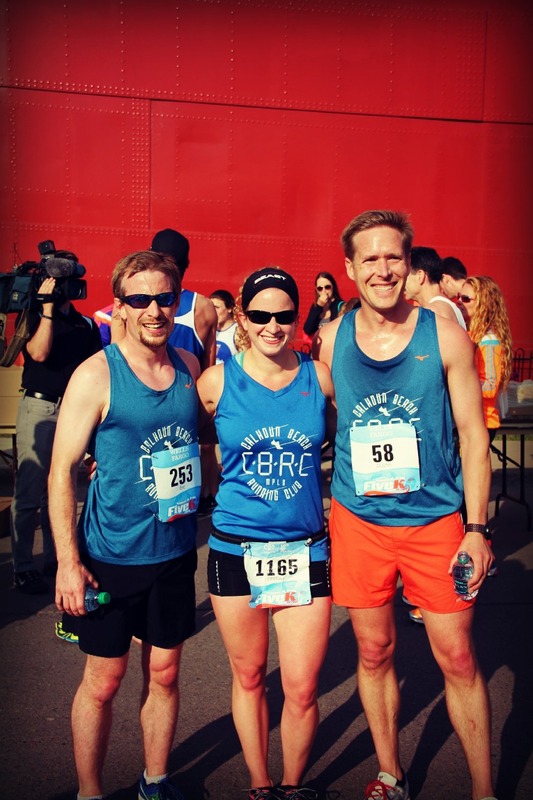 The course starts in Two Harbors, MN and runs south along scenic highway 61 to Duluth. 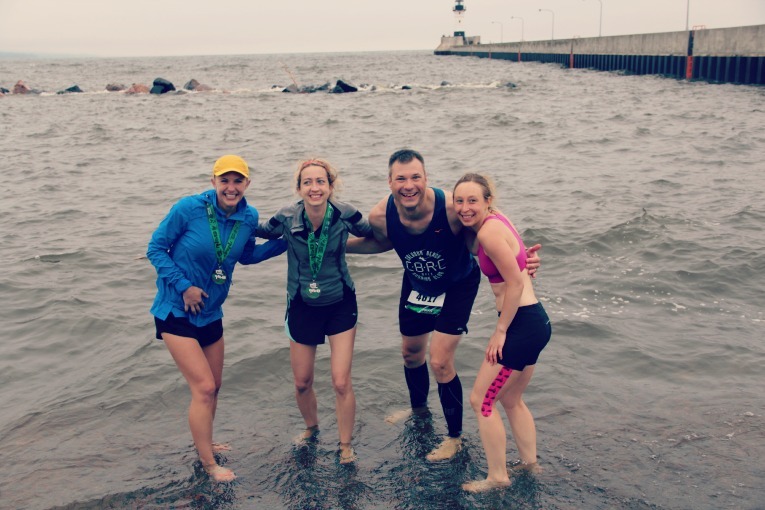 Beautiful Lake Superior is on your left for the whole course. The course is flat and fast. There is one “hill” at mile 22-ish called Lemondrop Hill. It was definitely noticeable. I don’t think that it was that steep, but the placement at the end of the marathon makes it much more significant. The miles flew by in the beginning. The first part of the course doesn’t have a lot of crowds, but every few miles there would be a big enthusiastic group of spectators. It would really push me. I almost preferred having the occasional cheering vs. constant cheering the whole time, as it seemed to have more of an effect on me. I was so glad I put my name on my shirt too as I received so many personalized cheers. It was grand! I knew that Dustin would be at various places along the course. He and our friend Eric both were biking the course to cheer. I had thought that I would see him around mile 9, but due to a bike issue with another friend who was cheering, he couldn’t make it there. Instead, I saw him for the first time just after the half-way mark and another 4-5 times along the course. It was a huge help to have his support as well as so many other great friends cheering. As you approach the city of Duluth, the spectators become much more frequent. The last 6 or so miles are right in the city and there are TONS of people out cheering. There were people handing out beer (I passed), there were people handing out bacon (I passed), there was a whole block lined with trolls (funny!) Several miles towards the end are on cobblestone, which could have been a little slick, but it wasn’t too bad. The final mile wraps around the William A. Irvin ship. It kind of seems to last forever, with lots of turns until alas, you FINALLY see the glorious finish line! The finish line of a marathon is one of the most emotional places I know. I have had plenty of finish lines where the emotions were not quite as positive as this one….But this one felt pretty darn good. I didn’t cry (this time), but there were moments earlier in the race when I realized that I was going to make my goal that I got a little choked up. But most of the time, it was all smiles! There were support stops on the course every two miles in the first half and I think almost every mile in the second half. The support stops had water and blue Powerade. Several of them were handing out ice, cold sponges, GU’s, fruit, and more. It was so well supported! Apparently, there were over 7,000 volunteers for the weekend at Grandma’s which is so amazing, considering there are only 7,000 marathoners. I am so thankful to all those volunteers. They really were top-notch! Personally, I took seven GU’s during this marathon. SEVEN! I have never taken that many. I went GU crazy, but it wasn’t bothering my stomach so I decided to just go with it. The best part of my Grandma’s experience was of course, this part- I achieved my goal of 3:45! That was my stretch goal especially with my broken toe. But in fact, I didn’t just achieve my goal, I came in 3 minutes under my goal! I have been trying to run a 3:45 for the past two years. I’m going to write a separate post about what I did differently in my training this season that I think helped me achieve this goal, but let’s just say I was excited about my time. Mile 22: 8:11 Lemon drop hill! This was a 13 minute improvement from the Tokyo Marathon. Well, 12 minutes and 32 seconds, to be exact. All my hard work finally paid off. Thank goodness. 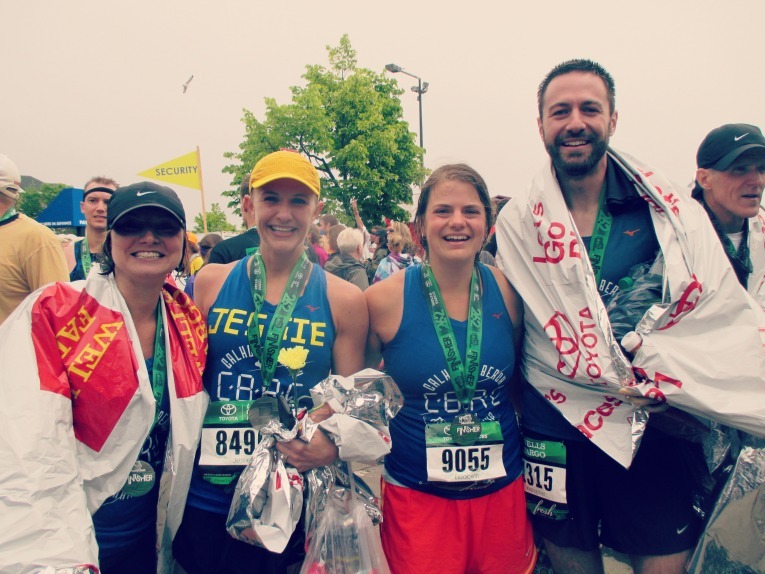 I was pretty pumped to update my PR page on the blog with this one. What about the broken toe? Still broken. The doctor said it would take 4-6 weeks to heal. I have to imagine running 26.2 miles didn’t speed up the recovery process. But I am grateful that it was just my pinkie toe, as it really wasn’t much of a factor on race day. It hurt a little during the race but mostly it hurt after. Conclusion? If you break a pinkie toe, you can still run a marathon. Don’t you worry- I’m definitely embracing this recovery time to let it fully heal. Post-race, I was given a flower (how sweet!) my medal, and a heat sheet. There were all kinds of goodies- yogurt, chocolate milk, fruit, Powerade, and more. It was also really easy to pick up my gear bag. I quickly changed into flip flops, as my running shoes were still sopping wet! I was really cold after the race, even though the temperature was warm by then, but the wet clothes were giving me the chills. 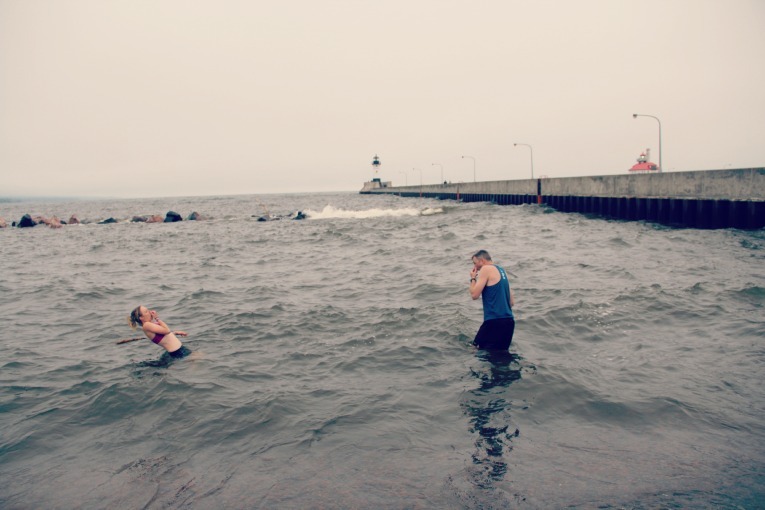 Apparently it is a Grandma’s tradition to soak your legs post- marathon in the frigid Lake Superior. I only ended up going in about shin deep, but two of the people with me went all the way underwater! Brave souls. After the short ice bath, we headed to the party tents. Runners received beers and more refreshments. I wasn’t quite ready for a beer, but I did devour an ice-cold Coke. Something about full-calorie Coke after a marathon is really refreshing…I don’t really drink soda any other time, but post-race, I love it. Of course my overall experience is colored by my personal performance. Grandma’s Marathon now has a special place in my heart. But it really is a fun weekend regardless of your personal performance. The whole city gets involved. Though that whole city involvement does lead to higher prices on hotels and lots of traffic, it also makes for a really fun experience overall. The party tents went on all weekend, with bands and music and a great celebration. I can see why this weekend is so popular every year. I am really glad that I decided to run this race. If you are looking for a fun, beautiful, fast marathon course, with loads of history and a friendly vibe, I definitely recommend Grandma’s Marathon. 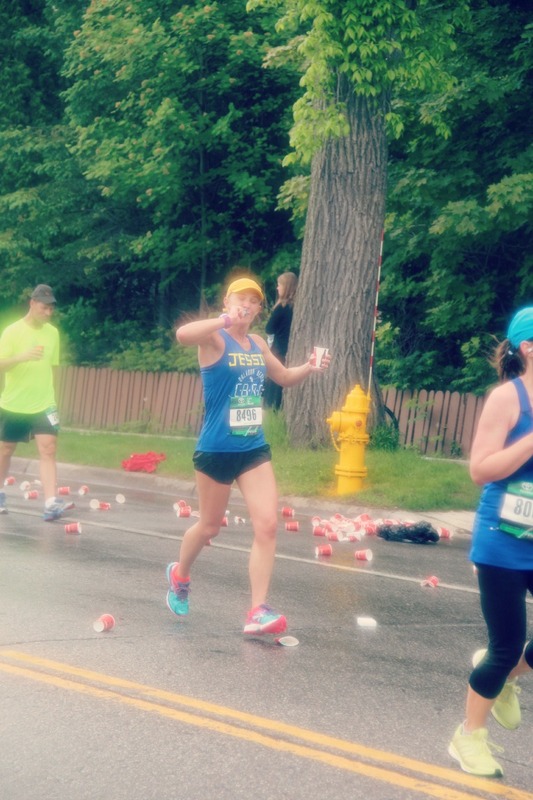 This marathon had such welcoming small-town charm to it. There weren’t as many runners wearing headphones as there are a lot of marathons, which helped to make it feel like a runner’s marathon, which I really liked. The marathon has been around for 39 years! I definitely appreciate the history and the love that the town had for this race and the marathon weekend. Post-shower, we grabbed food at “At Sara’s.” Then it was nap time…eventually we made it out to join the rest of the Calhoun Beach Running Club runners at the Canal Park Brewery for a few celebratory beers. 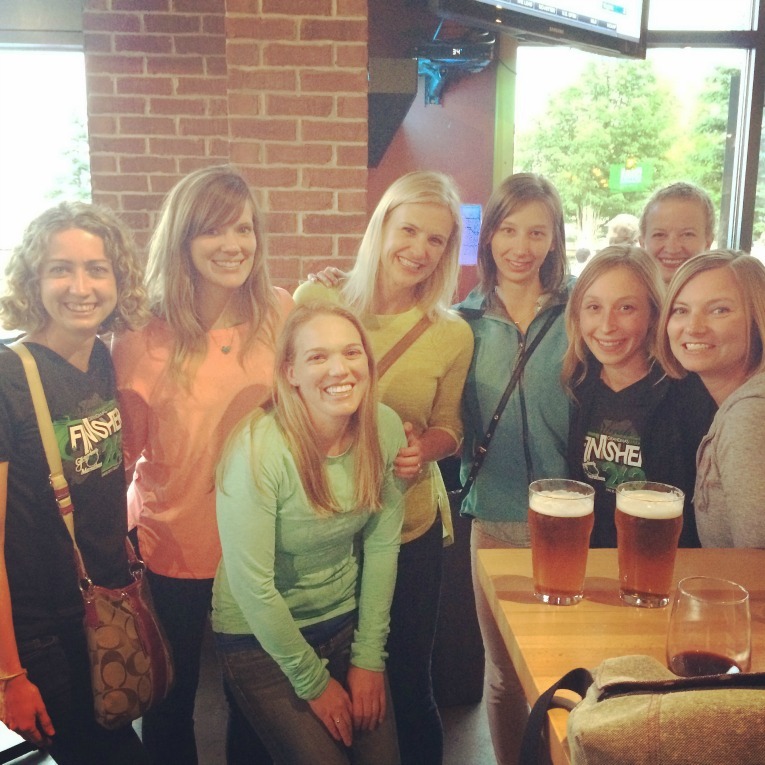 There were quite a few new Boston Qualifiers to celebrate! Congratulations to ALL of you- what an amazing weekend. Speaking of Boston Qualifiers, my new PR, 3:41:50, is not that far away from a BQ. If I cut 13 minutes off my time this year, another 6-7 minutes doesn’t seem so unobtainable. No matter what happens with my “new” BQ goal, I am incredibly grateful for my health and the support of my wonderful friends and family (especially Dustin! 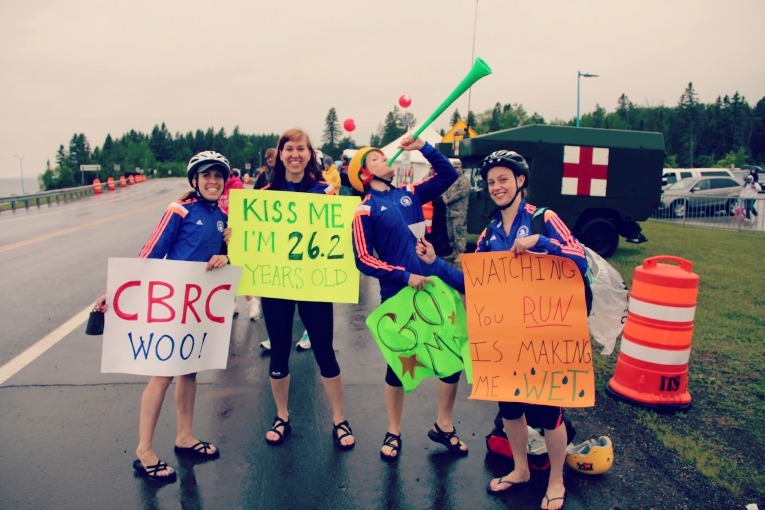 ), which led me to this wonderful experience that was Grandma’s Marathon 2015. Thank you so much Scallywag! It was a really fun weekend. Jessie! Phenomenal job! I’m really interested in the forthcoming post about what you did differently this year for your training. Congrats on a great race! Awesome job and terrific post! Your splits are quite impressive. Glad you smashed your goal even without all of your toes. Thank you so much Nathan. Much appreciated. I guess I should thank you for recommending Antonio! Thank you so much Hyedi! How did it go for your husband? Did you have fun cheering for him? Congratulations on the sub-3:45. Awesome job! Thank you very much Allison. 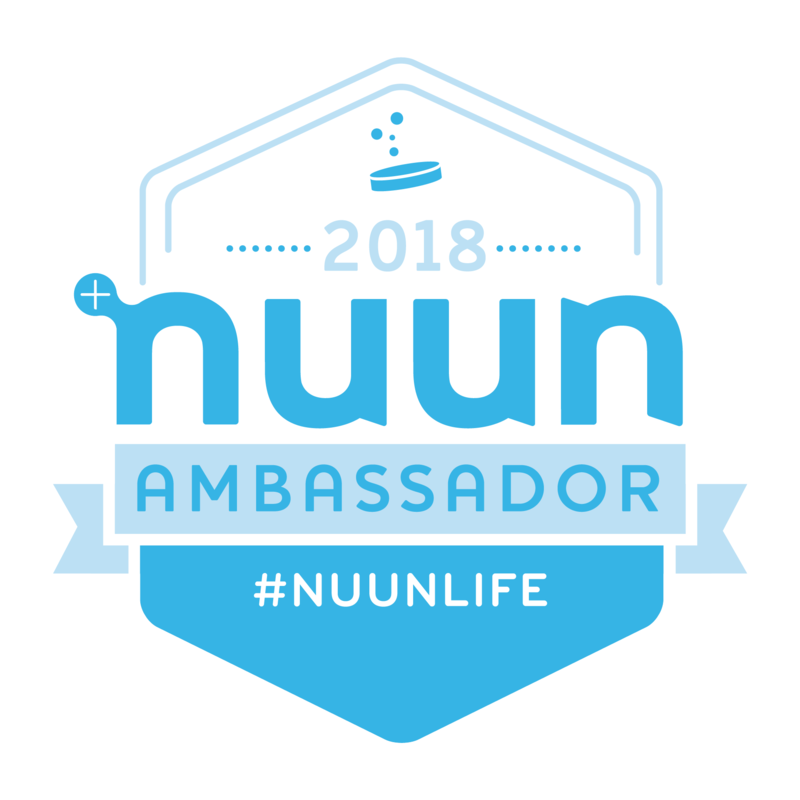 Looking forward to following along on your next running adventure! 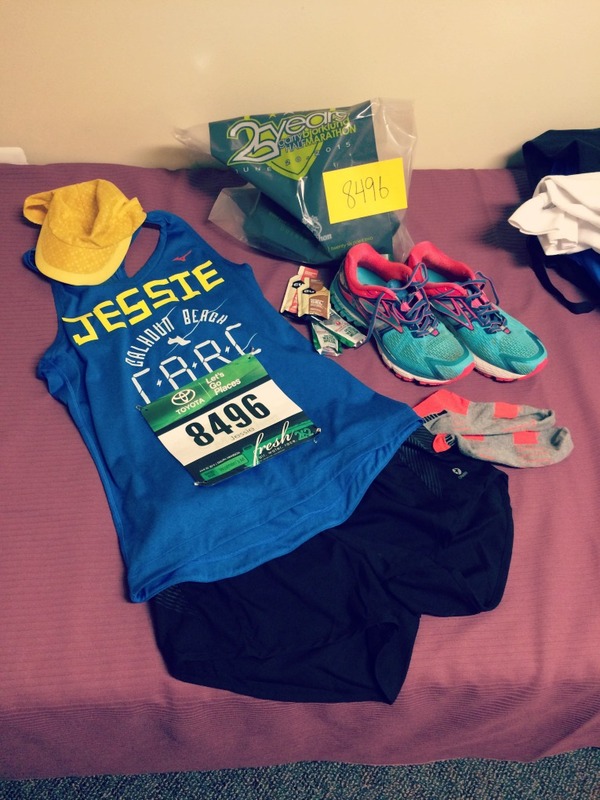 Congrats, Jessie! I was so excited for you when I saw your time online (I’m such a marathon time stalker..it’s like my way of “being there” when I’m not really there) and you’ve motivated me to think about signing up for another one 🙂 Hope you are enjoying a restful recovery week! Oh, I hope you do another marathon! Let me know which ones you’re considering. 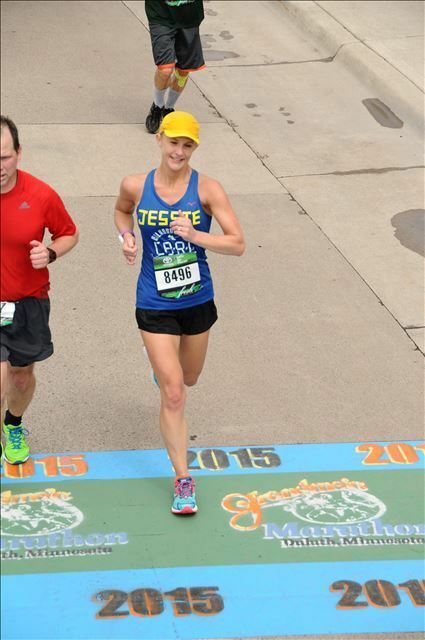 Jessie – Huge congratulations on smashing that PR! What a great breakthrough! You put in some really impressive training – so glad to see it pay off in a big way. Glad the toe was not a significant obstacle. Sorry for commenting so late – I was in Yellowstone on v̶a̶c̶a̶t̶i̶o̶n̶ high altitude training. You don’t have to apologize 🙂 I appreciate you reading and commenting! Sounds like a fun trip…you get to travel a lot! PS Did you run in Yellowstone? Good for you for running though in challenging conditions! Practicing your mental strength it seems. Really good advice about running in those locations though. You should do a Where to Run post! What a great recap! I am looking to run Grandma’s in 2016 and this really gives me an idea of what to expect. Thanks and congrats on that PR! Hi Chelsea! Welcome to the Right Fits 🙂 I see you are from Pittsburgh. What made you choose Grandma’s? You will love it! I have added your blog to my Bloglovin’ and look forward to following your training for 2016! Hey there, you mentioned your guy biked along the route – any tips for that? Are bicyclists able to be alongside the course? (I’m going to be bike spectating this weekend). Thanks for any help! hi April- are you just tracking one person? My husband suggested that you bike to the halfway point and then try to get ahead of your runner to see them multiple times along the back half. He said it was hard because you can’t bike on the actual course, you have to go back to the highway and bike quickly to get ahead. Once you get into Duluth, it’s a little easier because there’s a bike trail that goes along the course. I hope this helps!